Your online resource for first class captive bred Colubrids and Pythons. 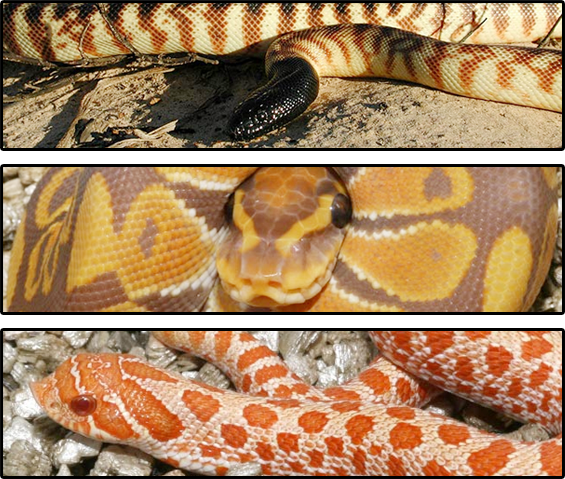 Our Reptile breeding business began in the late 1990’s and was primarily driven by our passion for producing beautiful varieties of Corn Snakes, Eastern King Snakes, Western Hognose Snakes and some unique Orange Texas and Russian Rat Snakes. Over time, our knowledge, experience, enjoyment and success in the “Snake Business” grew along with our continually expanding collection. After our 2004 acquisition of Rare Earth’s Eastern Black-headed Python collection and the timely purchase of our Ultramel Ball Python stock in 2006, our breeding program required some strategic re-alignment. We began to redirect our efforts away from volume-based breeding to a more selective breeding process focused on the expected outcomes of color, pattern, and vigor. Today we have a reduced, yet refined, collection that is a clear reflection of our philosophy of working only with the animals we “love to work with”. We are proud to present offspring of these animals to you through the Split Rock Reptiles updated available page. Our specialty is producing stunningly beautiful line-bred Black-headed Pythons, exclusive Ball Python morphs (Pastel Ultramels, Ultramels & Ultramel combos), rare locality King Snakes (Outer Banks Kings, Lemon Speckled Kings and Apricot Speckled Kings) and unusual Mexicana Complex King Snakes (Black Phase Mex-Mex , Granite Phase Mex-Mex and Durango Mountain King Snakes). We also take great pleasure in working with our line of iridescent Costa Rican Black Milk Snakes and our diverse and best-loved collection of Western Hognose Snakes (Anaconda, Banded & Extreme Red Albino, Hypomelanistic, and Toffee Belly). We look forward helping you enhance your collection by providing you with first class animals that you too will “love to work with”!